Without sound too hyperbolic, I genuinely believe writer-director Mike Flanagan is one of the genre's most promising directors today. Absentia was a quiet, dramatic burn with a unique concept that outweighed any imperfections this 2011 indie film shouldered. 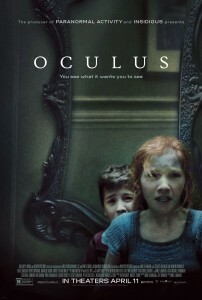 Oculus, which played at SXSW and opens April 11th, more than demonstrates he won't be contained to a sub-genre and is eager to push the narrative boundaries of horror in more ways than one. Oculus is an incredibly ambitious effort. It's playful and devious, a fearsome, unpredictable presence much like the object at the center of the film – a mirror that has notoriously traded hands for decades until it landed in the home of the Russell family. Oculus is their story, and, Flanagan hops between past and present, focusing on Kaylie and Tim Russell in their youth and in their 20s living in the wake of a family tragedy. We see their story unfold in both timelines through the entirety of the film and Flanagan not only shows a strong command of maneuvering between both time periods, but he makes both stories incredibly suspenseful. In one story thread we have Kaylie and Tim watching the aforemention mirror – via a supernatural presence – chisels away at their parents' psyche until the unthinkable happens. In the present day, Tim is being released from the hospital and Kaylie has tracked down and acquired the mirror to fulfill a "promise" she made with her brother. To discuss any further of the plot would ruin some of the film's impact. Just know that Flanagan steers his stories in refreshing directions with two characters that are smart and bold and think as the audience would. They're ahead of the curve and so is the film, turning familiar scare tropes on their head while making sure its viewer is constantly engaged in the drama and invested in its leads. Karen Gillan is arresting as Kaylie, a determined young woman whose design to take on the mirror is clever. And Brenton Thwaites brings a good vulnerability to his role as Tim. It's also nice to see Katee Sackhoff take on a maternal role even if what happens to her character feels slightly out of place in a movie of this ilk. Oculus is smart and scary stuff, gang. Flanagan is no slacker. There's an intelligent precision in his work, not just visually but within his writing as well. And, I'm sure, on a revisit I'll pick up details I didn't pick up the first time around. By far, it's definitely one of the horror highlights of SXSW.